Dallas has now bumped Houston out of the top spot for the most apartment completions over the current cycle, which began in 2010. Big D should pull further ahead in the short term, since scheduled deliveries over the next year remain elevated in Dallas but slow in Houston. 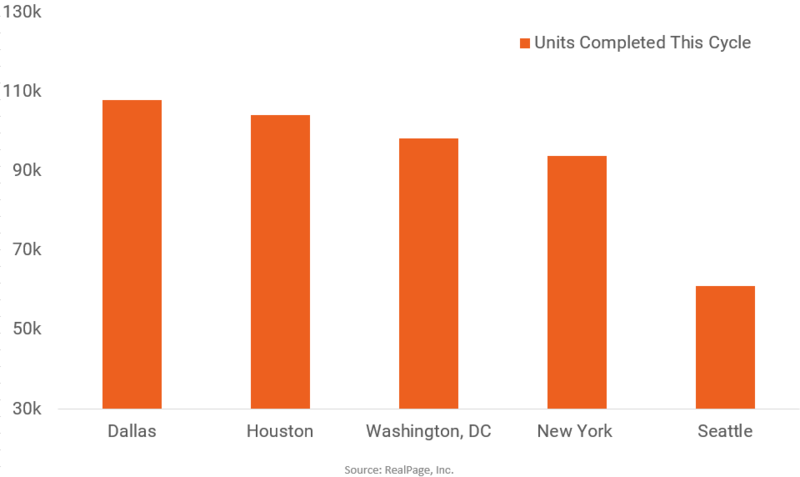 DC and New York are the two other contenders in terms of metros adding the most multifamily stock this cycle. Meanwhile, Seattle, which has seen a huge drop-off in construction volume lately, sits in the #5 spot for deliveries during the cycle. Chelsea LeHew is a Senior Market Analyst for RealPage, Inc., where she is heavily involved in apartment data integrity and methodology, as well as data-driven product development. Chelsea is also the principal analyst for Southwest region markets, but has broad knowledge of multifamily trends across the nation. Prior to joining RealPage, Chelsea specialized in market research and analysis for a business brokerage firm and for the Dallas Federal Reserve. Chelsea is a Virginia native and holds a bachelor’s degree in economics from University of Mary Washington.